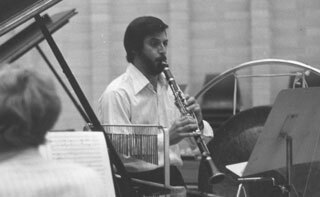 F. Gerard Errante is a clarinetist of international stature whose performances in the United States, Canada, Europe, Australia, New Zealand, China, Korea, Japan, Africa, Cuba and the South Pacific have received critical acclaim. A native of New York City, he earned the Doctor of Musical Arts degree from the University of Michigan. Errante has published two books, A Selective Clarinet Bibliography and Contemporary Clarinet Repertoire, composed ten works for clarinet, and has contributed numerous articles to a wide variety of journals. He has recorded for the CRI label, Telarc, Centaur Records, Mark Recordings, Capstone Records, Drimala Records, AIR Records, Inc. (Japan), Apollo Records (The Netherlands), Tall Poppies (Australia), and for national radio stations throughout the world. His three compact discs, Electric Clarinet, Shadows of Ancient Dreams, and Beyond Noend with Errante, contain his own works as well as compositions for clarinet and electronics that have been composed for him. These CDs, as well as several earlier LPs, have received high praise from reviews worldwide, citing their originality and exceptional performances. A specialist in new music, Errante has performed at many international festivals and was a second prizewinner in the International Gaudeamus Competition for Interpreters of Contemporary Music. 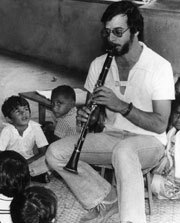 Errante is an active participant in the international clarinet community and has served as President of both ClariNetwork International and the International Clarinet Association. He was also the Southeast Regional Chairman of the ICA from its inception in 1973, to his assumption of the position President-Elect in 1992. In addition, he has performed at many of its Festivals held in the United States, Canada, and Europe. Honored by the ICA, Errante was presented a Lifetime Achievement Award at the 2005 ClarinetFest held in Tokyo. On two occasions Errante served as Artist-in-Residence at the Sydney Conservatorium of Music in Sydney, Australia. He has also toured Japan under the auspices of the Asian Cultural Council. After 30 years of service, Dr. Errante retired from Norfolk State University where he was Professor of Music. He twice received the Outstanding Teacher of the Year award and was twice nominated for the highest teaching award in the state of Virginia. Errante has also served as Adjunct Professor of Music at Old Dominion University where he was a founding member of the new music ensemble, Creo. In addition, he has served as Co Director of the Norfolk Chamber Consort, a position he has held from 1972 to 2008. Now as resident of Las Vegas, Errante tours with the duo Clarion Synthesis. F. Gerard Errante is a Yamaha performing artist and performs exclusively on a Custom SE-V clarinet. He also performs using Clark Fobes mouthpieces, Passion reeds by Reeds Australia, and BG ligatures.